SODIR products are creatively designed electric countertop cooking equipment that permit the addition of innovative food service items to a menu at a reasonable cost. The SODIR products are versatile, attractively styled, of high quality and competitively priced. Many of the products are available in 120V, fitting easily on any counter and capable of being plugged in almost anywhere. Equipex offers the highest quality products at competitive prices in the marketplace. With this commitment comes professional, personal service and the varied experience of our staff. Our products have strong potential in both traditional foodservice and chain/convenience/grocery store market segments. The products all have unique characteristics, are of high quality and are extremely competitively priced, thus achieving the goal of best value. 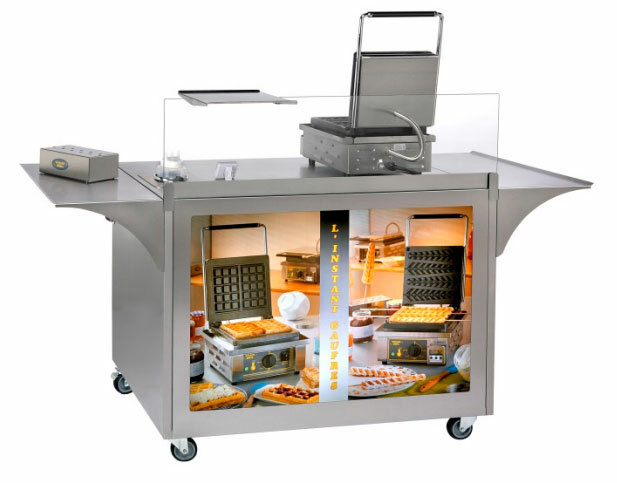 SODIR products are creatively designed and manufactured electric countertop cooking and display equipment that permit the addition of innovative food service items to a menu at a reasonable cost. The SODIR products are especially appealing when the versatility, styling, quality and price are considered.  Panini Grills – five (5) sizes and a wide variety of plate surfaces – primary application is to cook “panini” sandwiches, a raging food trend today, but also perfect for steaks, hamburgers, fish and vegetables. Contract feeders have taken strongly to this concept. Available in several voltages. Models Panini XL 14” x 14” surface grills are available with optional electronic timers for maximizing production.  Convection Ovens – two (2) ¼ size and (2) ½ size models – ideal for kiosks and specialty baking/merchandising. All models are available in both 208/240V and 120V. Larger ¼ size and ½ size ovens may be ordered with a broiling feature, especially useful in dessert stations - one (1) ¼ size oven available in an attractive decorative black finish with brass hardware for front of the house applications. Full size (4) sheet pan oven with steam and two speed motor, with or without high speed finishing capability.  Finishing ovens (salamanders) – two (2) models – one unit has an infinitely adjustable moveable top – a truly unique feature permitting the chef to have infinite control in cooking and finishing. These units are extremely popular and a SODIR signature item, featured in many magazines. Any classically-trained chefs, such as in fine dining restaurants or hotels, will prefer this item.  Rotisseries – five (5) models available plus one (1) warming cabinet. The 1, 2, 3 and 4 spit units or five basket carousel model are attractively styled and relatively inexpensive. Now, the customer can roast chicken, fish, meat and vegetables, all in our compact, visually pleasing units. 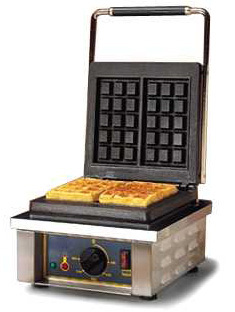  Crepe Machines – single and double units available, with storage drawer underneath. A real European crepe maker. Equipped with special enamel coated cast iron surface to permit even and consistent baking. Furnished with batter spreader. 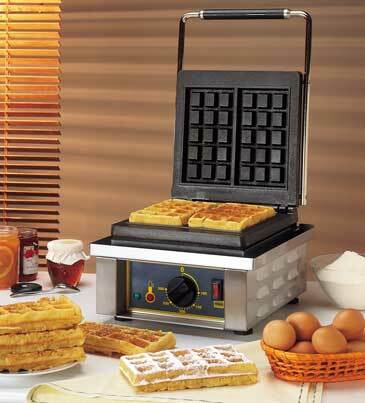 120V professional version available for dessert and buffet stations. 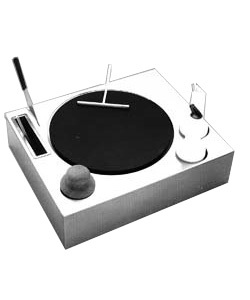 Crepe kits available for each model. Blini-top version introduces new possibilities.  Snack Toasters – single and two shelf models – without or with shelf mounted door handle – ideal for quick toasting or melting of open face sandwiches or for toasting garlic and focaccia breads. Wide variety of sizes and voltages. 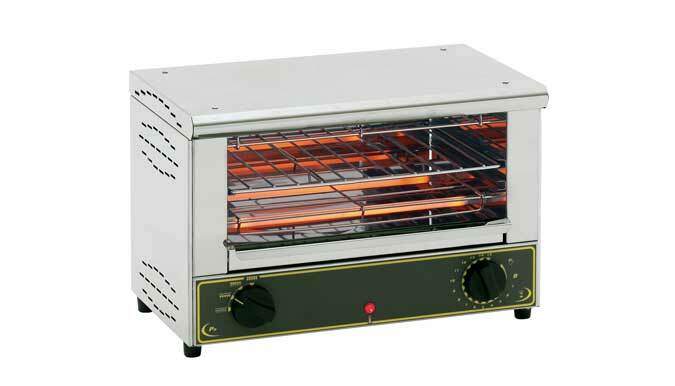 Can be used as a commercial toaster oven or a salamander. 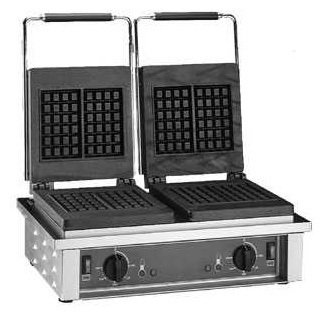  Griddles & Planchas - the griddles, in two (2) sizes, are made of 1) fine-grain cast iron, 2) cold- rolled steel, and 3) chrome. The units are extremely competitive in pricing and the grill surfaces are excellent for a variety of cooking applications. Perfect for small footprint spaces without the hassle of gas. Also ideal to place on a counter for a breakfast program. Available in 208/240 and 120V.  Fryers – three (3) models – the smallest operates on 120 V and is ideal for small, seasonal operations, caterers or appetizer stations. All three are incredibly simple to operate and clean, along with being priced very favorably. Egg cooker is available for use with water. 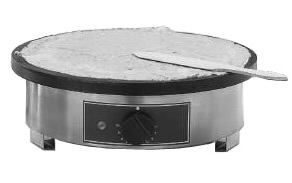  Pizza Ovens - three (3) models available – quartz-heating elements with firebrick – will cook a 12” pizza in 3-6 minutes at 600 F. It is a real pizza oven, not a warming or a reheating device. Units are available in 120 V or 208/240V. Shovel oven type available for more traditional uses.  Gyros Grills – design permits easy operation and cleaning – 3 models available – with optional accessories including kebab kit, hinged glass doors, wind deflectors and more. Great for gyros, taco al pastor, etc.  Specialty Products – a) Gourmet hot dog machines with bread spike toaster – a unique merchandising method for a popular food product; b) countertop smokers for fish, meats and cheese – a flavor enhancer and a money saver.  Heated Countertop Display – one or two-shelf models, both with light fixture, dual service, humidity pan, temperature up to 225 F. Stainless steel or gold tone exterior finishes are available. Single and double shelf models available without light. Curved glass front Turboheat warming display with 4 ½ pan capacity enhances countertop merchandising possibilities. Three-pan bain marie with curved glass front adds flexibility. And finally, the one and two-pan Euro curved-glass heated displays permit maximum capacity in minimum space.  Chilled Panoramic Displays – attractive chilled displays – stainless steel or laminated exterior finishes – hinged flat or dual service dome covers – eutectic chill plates for up to 5 hours – ideal for desserts, salads or sandwiches.  Elegant Service Carts – hardwood structure with laminated shelves – sliding dish shelf – swivel casters – walnut exterior in two different styles and sizes.